Spend the 4th (Fri) among aquatic life with a scuba or snorkeling tour. And it doesn't end there: stroll through Catseye Beach, don't miss a visit to Passage Peak, head outdoors with Jetryder, and take in the exciting artwork at Hamilton Island Art Gallery. To see reviews, maps, ratings, and more tourist information, go to the Hamilton Island planner . Melbourne to Hamilton Island is an approximately 4.5-hour flight. You can also do a combination of bus, car, and ferry. Traveling from Melbourne in October, you will find days in Hamilton Island are somewhat warmer (31°C), and nights are much warmer (25°C). 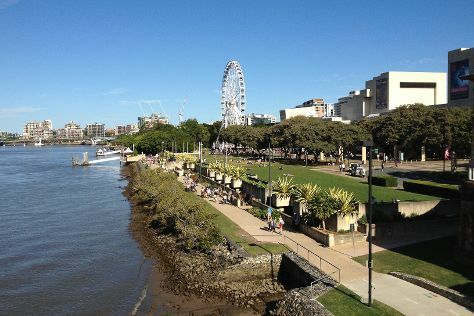 Finish your sightseeing early on the 5th (Sat) so you can travel to Brisbane. Change things up with a short trip to Sea World Theme Park in Main Beach (about 1h 30 min away). There's much more to do: let the kids burn off some steam at South Bank Parklands, look for all kinds of wild species at Lone Pine Koala Sanctuary, take in nature's colorful creations at Roma Street Parkland, and take some stellar pictures from Mount Coot-tha Lookout. To find reviews, ratings, traveler tips, and other tourist information, use the Brisbane road trip website . Traveling by flight from Hamilton Island to Brisbane takes 3.5 hours. Alternatively, you can do a combination of ferry, bus, and train; or do a combination of ferry and bus. Traveling from Hamilton Island in October, plan for a bit cooler nights in Brisbane, with lows around 19°C. Wrap up your sightseeing on the 8th (Tue) early enough to travel back home.